29 September 2006: After more than four months, there is still no solution in sight to the mayhem resulting from the conflict between teachers and the southern Mexican state of Oaxaca. So far it has resulted in two deaths, widespread disruption and the loss of two billion pesos. On 28 September 2006, the state was paralized by a shut-down of most businesses and bus services. Almost 6,000 shops closed for 48 hours. Earlier more than 300 mayors travelled to Mexico City urging the government to end the conflict. 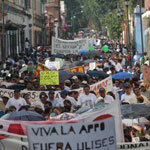 It all began last 22 May 2006 when a massive sit-in took place in the centre of the state capital Oaxaca de Juarez. Enrique Rueda Pacheco, head of Section 22 of the National Union of Education Workers (SNTE) had called for the sit-in, demanding that the state government reassigned the 70,000 education workers from economic zone 11 to economic zone 111. Under labour law, each area in the country is divided into zones for the purposes of establishing minimum wages for teachers. From that original demand they moved on, calling for the resignation of the state governor, Ulises Ruiz Ortiz, of the Institutional Revolutionary Party (PRI). This followed a failed attempt to disperse the sit-in on 14 June when police used a helicopter to drop tear gas on the crowds. From that day on, militants and sympathisers from more than 300 social and political organisations have joined the teachers’ movement. The centre of Oaxaca de Juarez, the site of the sit-in, is a scene of roadblocks, occupied public buildings, closed banks and marches involving up to 800,000 demonstrators. It has become a no man’s land. There is no authority and no law - there is nothing but damage, not only to the city’s beautiful colonial buildings and to the economy, but also to the school children and to the people’s peace. And yet there is no one to blame. Global Exchange, an international human rights group based in San Francisco, is urging its members to contact outgoing Mexican President Vicente Fox to call for him to refrain from using Federal force to put down civil unrest in Oaxaca. “Federal intervention in this situation is certain to escalate the conflict and poses tremendous and unnecessary risks to the people of Oaxaca City and State,” said Ted Lewis, founding director of Global Exchange’s Mexico Program. In recent days Oaxaca Governor, Ulises Ruiz has publicly called on the federal government to send federal police or the army to quell the massive protests that have shut down state government in Oaxaca. Meanwhile Oaxaca State police have been witnessed and filmed carrying out armed raids against the protesters, shooting into marches and encampments. The protest coalition “Popular Assembly of the Peoples of Oaxaca” (APPO in Spanish) has wide support amongst the population in Oaxaca City, Oaxaca State and even across the country. And while most of the APPO actions have been civil in nature, the organization has maintained a position of using self-defense when police attack or make efforts to lift their encampments. Due to the number of APPO protesters and the scale of their organization across the city, it is very likely that any attempt to forcibly remove protesters would result in a serious and potentially lethal confrontation injurious to APPO members as well as uninvolved local residents. Tourism, the main income source of Oaxaca, has fallen by 80 per cent. The head of the Hotels and Motels Association of Oaxaca, Fredy Alcantara, said losses in that sector have reached more than one billion pesos. Some 27 companies have closed down and more than 800 people have lost their jobs. Many of them are emigrating to America. 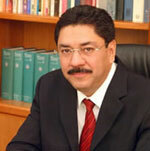 The transport sector has also reported great losses, with many vehicles being burned in the protests. The teachers and their many supporters in the Popular Assembly of People of Oaxaca (APPO) are attacking the employers, calling them “people’s exploiters” and “people’s enemies”. The fact that social groups have joined the teachers’ movement prevents the state government from applying direct force. So, it is thought that from 14 June, intimidation tactics and a “dirty war” are being pursued, including the training of paramilitary groups. The Human Rights Web of Oaxaca states that police are in plainclothes, or dressed in black and wearing face hoods, and driving plate-less cars. In recent demonstrations they have fired against the civil population, killing two men. According to “Proceso Magazine” examples of this “terrorism” include damage to “Radio Universidad”, and the ‘commando’ abduction on August 11 of the ex-secretary general of Section 22 of the SNTE, Erangelio Mendoza, who was taken to the penitentiary of Ciucatlán. The following day, another group dressed as civilians, shot up the premises of the Oxacan Corporation of Radio and TV, held by the teachers and the APPO. At night it is common to hear gunfire by unknown groups, which many have dubbed “the death commandos”. The propagation of rumour is another intimidation tactic, which is provoking hysteria among Oaxaca’s populace. Some 28 members of APPO and Section 22 of the SNTE held a meeting with Carlos Abascal, Secretary of the Department of the Interior, on August 29 in Mexico City in order to negotiate and put an end to the conflict. Meanwhile, on the same day, there was a commercial stoppage in Oaxaca, with the banks and almost 6,500 commercial and services establishments and schools remaining closed all day, demanding a solution. At the meeting, the Presidency’s spokesman, Rubén Aguilar, stated that the resignation of Governor Ulises Ruiz would be a subject for negotiation and that the state government would participate fully in such negotiations. Prior to the meeting, Enrique Rueda Pacheco, leader of the teachers of Oaxaca, said they wished for a dialogue, but not to negotiate with Mr. Abascal. They wanted to hear the stance of the Department of the Interior on three of their demands: The resignation of Ulises Ruiz as Oaxaca’s governor. The immediate and unconditional release of arrested colleagues. The cancellation of all arrest orders. Flavio Sosa, leader of APPO, on the other hand said that his organisation’s main demand was the resignation of Ulises Ruiz, but, unlike Rueda Pacheco, he said he would be willing to hear proposals by Mr. Abascal. Rueda Pacheco and Sosa denied that any armed group like the Popular Revolutionary Army (EPR), or any political party like the PRD, was participating in their movement. They both also denied any institutional link with the civil resistance of Andrés Manuel López Obrador “AMLO”, former Mexico City Mayor. President Fox “does not either put or remove governors”. Due to the federal government’s refusal to remove the governor, Ulises Ruiz, the negotiations ended, but with agreement for further talks. Five further meetings were held, the last on September 20, without success and with no new date for another meeting. The truth is that no one bothers to try solving the problem, which has become a national issue. On one hand the PRI party, currently ruling the state, does not want Ulises Ruiz to be removed because that would mean an election and it knows it would lose. On the other hand, Mr. Abascal, Secretary of the Interior and member of the right-wing PAN Party, wants to keep his post in the new cabinet for the next presidential period, and for that reason does not want to do anything that would jeopardise it. Meanwhile, APPO and Section 22 of the SNTE have warned that they will soon take the demonstration to Mexico City, threatening to block embassies and the Senate until Governor Ruiz is removed. The reverse view of the conflict sees it as a traditional ritual going back 26 years, with teachers organising sit-ins to demand more posts and more money  without academic improvement. Those are the views of Gloria Zafra of the Institute of Sociologic Research of the Autonomous University Benito Juarez of Oaxaca, reported last August 29 in “The Universal” newspaper. Teachers have always demanded economic zone reassignment, but at the same time, she says, they have never been left empty handed. Support for the teachers from APPO, she added, was not unusual because APPO was headed by the politically active arms of the teaching body. Mexico City, 6 December 2006: In a joint operative by Mexico’s Preventive Federal Police (PFP) and the Federal Agency of Investigations (AFI), Flavio Sosa, leader of the Popular Assembly of the Peoples of Oaxaca (APPO), was arrested in Mexico City along three other members of the organization. The arrests took place on 4 December 2006 after a press conference in which Mr Sosa announced he would be meeting the next day the country’s new Ministry of Interior Affairs Mr. Francisco Ramirez Acuña. Flavio Sosa is a controversial figure in Mexican politics having supported the former conservative President Vicente Fox during his election campaign. However, after Fox did not offer him a position in his government and Sosa broke with the president to form and lead APPO. Mr. Sosa was taken to the federal maximum-security prison where he has been charged with kidnap, assaults, theft and intentional damages by arson and attacks on communication. As all charges were filed by the state authorities of Oaxaca he should have been taken to a prison in Oaxaca. However, authorities claim that, as he is such a “highly dangerous” figure, it would have been too risky to transfer him to his home province. What authorities feared, of course, was more protests by APPO supporters if Sosa were imprisoned locally.